Everyone knew the snow was coming. But the flooding that swamped Boston’s coastal neighborhoods Thursday came as an icy shock and raised fresh questions about how to best build along the city’s waterfronts in a time of rising seas. An unusually high tide, whipped by winds that gusted as high as 76 miles an hour, washed pools of frigid water into the streets of the Seaport, Fort Point, and the downtown waterfront Thursday afternoon. A stretch of the Blue Line in East Boston was briefly shut down, while firefighters pulled a man from a flooded car in Neponset Circle in Dorchester. Even the city’s tow lot, in low-lying Widett Circle, was partly underwater. And while Bostonians have grown accustomed to watching high seas hit South Shore sea walls during big winter storms, the sights of major downtown streets submerged, of East Boston’s Piers Park underwater, and of a red dinghy on Long Wharf took many by surprise. By some measures, the surge was the biggest in nearly 40 years. 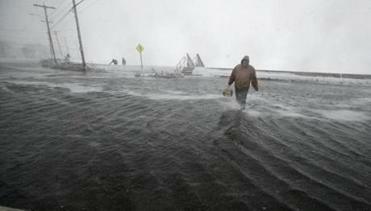 From Boston to Barnstable, here’s a look at how bad the coastal flooding got on Thursday. Meteorologists at the National Weather Service were still compiling the data from tide gauges across the region, but they said one gauge near Logan International Airport registered sea levels as high as 15.25 feet, more than 6 feet above a normal high tide, and a bit higher than crests during the Blizzard of 1978. But these records are difficult to compare, as seas have risen in Boston by nearly a foot over the past century, said Glenn Field, a meteorologist at the National Weather Service. In some ways, he said, Thursday’s flooding could have been worse. The quickly formed storm, known as a bomb cyclone, left little time for the strong winds to whip up the seas. “As bad as some of the flooding was today, it wasn’t as bad as 1978, when there was a lot more wave action,” Field said. Now, the danger will shift to ice. While waters were receding Thursday afternoon, city fire and sewer crews worked to clear flooded streets, basements, and low-lying areas of water before temperatures plunge over the weekend, causing a deep freeze. Fire Commissioner Joseph Finn said officials were particularly concerned about buildings that had also lost power, as some did on the downtown waterfront, where a set of transformers blew near Long Wharf. “We’re going through every building there,” Finn said. Longer term, the flooding raises questions about Boston’s waterfront building boom. From East Boston to the Seaport District to Port Norfolk in Dorchester, many of the places that were inundated Thursday are also hot spots for new development, as neighborhoods around Boston Harbor become ever-more-desirable places to live. A little more than a year ago the city released its Climate Ready Boston plan, designed to find ways to help the city cope with climate change, including sea-level rise. And they’ve begun working on neighborhood-level plans to reduce the impact of flooding and other problems that are expected to grow. Thursday’s storm highlights the urgency of those plans, said Mayor Martin J. Walsh. Some developers already are planning for higher seas. Many new buildings now have mechanical systems placed on the roof to protect them from rising waters. A condo project under construction in East Boston has its ground floor — which juts out into Boston Harbor — set up as bike and boat rental and designed to be essentially floodable. Plans to redevelop Suffolk Downs, alongside marshlands on the northern edge of East Boston, include an elaborate system of landscaping designed for storm surge to flow through without damaging buildings. Those are all good ideas, said Kathy Abbott, president of Boston Harbor Now, and first thing Friday she planned to explore how new Seaport buildings with flood defenses fared amid the waters Thursday. But they won’t do much to help older neighbors in a city where many waterfront buildings have stood for a century. It’s time to start talking about ways to protect entire neighborhoods from rising seas, Abbott said. Actually, she said, Thursday’s storm showed it’s well past time. And experts expect it will become more common, with sea levels in the region projected to rise between 3 and 7 feet by the end of the century. A city report in 2015 found that rising sea levels could make major flooding three times more frequent by 2030 and 10 times more common by 2050. Both Walsh and Jack Clarke, director of public policy at Mass Audubon, said Thursday’s storm is a wake-up call. “The reality of climate change makes storms like this the new normal,” Clarke said. Indeed it was so intense that flooding exceeded what scientists typically call a 100-year storm, meaning one like it only comes once a century. Climate change, though, is fast upending those calculations. Steve Annear of the Globe Staff contributed to this report. Tim Logan can be reached at tim.logan@globe.com. Follow him on Twitter at @bytimlogan. David Abel can be reached at dabel@globe.com. Follow him on Twitter @davabel.